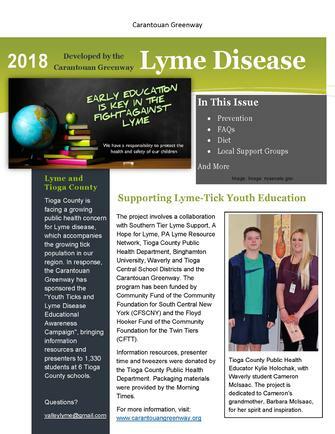 April 2, 2018, Youth Ticks and Lyme Disease Educational Awareness Campaign Reaches Over 1,300 Children and Families With School Presentations and Prevention Materials. May 9, 2017, “Advocates to Rally on State Capitol, Calling for Fair Insurance Coverage of Lyme Disease Treatment” - click here for the press release. 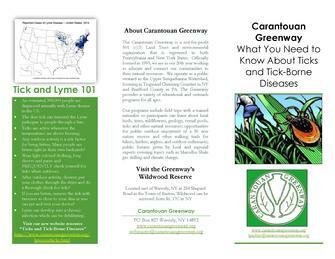 Click on the image above to download the Youth Lyme-Tick Educational Awareness brochure! Click on the image above to download the Tick brochure! The black-legged tick is the carrier for Lyme disease, the most commonly borne vector disease in the U.S. In response to the growing public health concern for Lyme disease, which accompanies the growing tick population in our region, the Carantouan Greenway has been awarded a grant from the Mildred Faulkner Truman Foundation for a Ticks and Lyme Disease Educational Awareness Campaign. The spring 2016 project includes procurement of four rugged-aluminum educational awareness signs to be distributed in various high-traffic outdoor community areas; as well as design and provision of digital and print resources, e. Sign locations will include 1) Wildwood Reserve, 2) Waverly Glenn, 3) East Waverly Park, and 4) Apalachin’s Waterman Conservation Center. With over 25,000 total annual visitors at these locations, the impact potential for educational-awareness is immense. 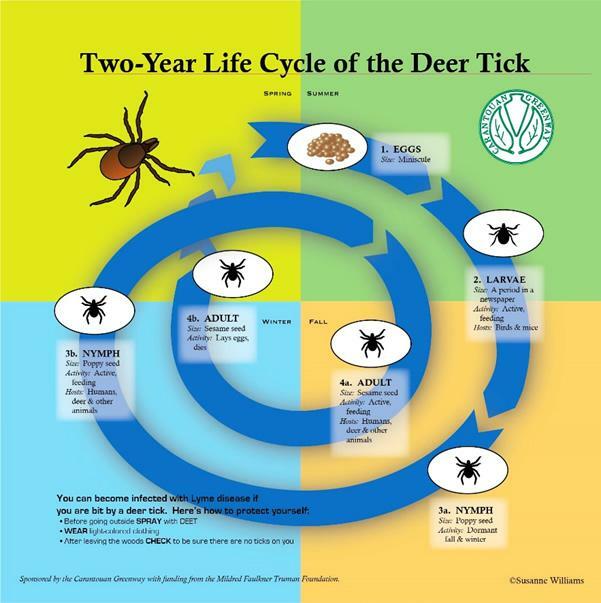 The signs, which depict the two-year life cycle of the tick, were designed by Carantouan Board member Sue Williams. The Carantouan Greenway would like to express our gratitude to Mandy Roome, a doctoral student of Ralph Garruto at SUNY Binghamton; for all her hard work in the developing this site. And also to the Mildred Faulkner Truman Foundation for their generous financial support. 1. What species of ticks live in this area? 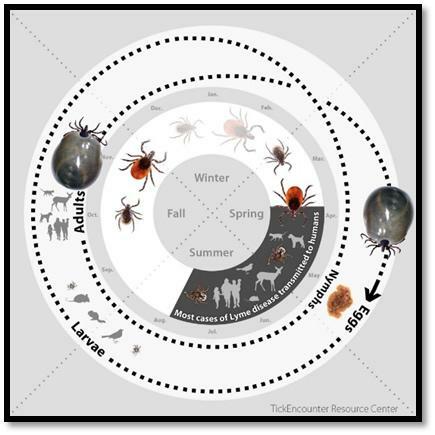 In New York, we have deer ticks (Ixodes scapularis), Dog ticks (Dermacentor variabilis), Lone Star Ticks (Amblyomma americanum), and Brown Dog Ticks (Rhipicephalus sanguineus). 2. Can all ticks transmit Lyme disease? No! In New York, the only tick that can carry and transmit the Lyme pathogen to humans is the deer tick. On the West Coast of the US, the Western Blacklegged Tick (Ixodes pacificus) is responsible for transmitting the Lyme pathogen to humans. 3. What pathogens can ticks carry? None known (yet) in the Northeast. However, Rocky Mountain Spotted Fever has been found in Brown Dog Ticks in the Southwestern US. 4. When are ticks active? Ixodes scapularis, more commonly known as the deer tick (the most common tick in our region) can be active in ALL seasons. As long as temperatures are above freezing, ticks will remain active. 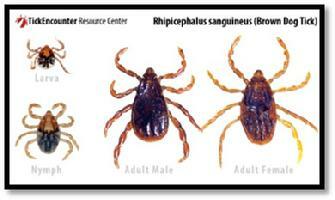 In mild winters, or short periods of warmer (above freezing) temperatures, ticks will be active. Eggs typically hatch during late summer and larvae emerge. Larvae are very small, about the size of a pin head, and very hard to detect. However, larvae are not considered a danger to humans for transmitting Borrelia burgdorferi, the causative agent of Lyme disease. The Lyme pathogen is not transmitted from mother to offspring, and can only be acquired through a blood meal (from an infected mammal, typically small rodents such as the white-footed mouse). Once larvae have taken a blood meal, they may have picked up the Lyme pathogen if they fed on an infected mammal. They molt into the next life stage, which is the nymph. Nymphal ticks are still very small, about the size of a poppy seed, and typically emerge during the late spring and summer months. Ticks in this stage are considered the biggest threat to humans, as they have taken a blood meal and have been able to acquire the infection and are hard to detect because of their small size. The vast majority of Lyme disease cases in humans are diagnosed during the summer months, likely because people are in more contact with vegetation in hotter months and these small ticks often go undetected. Nymphal ticks take a blood meal and molt into adult ticks during the fall (giving them another opportunity to potentially pick up the Lyme pathogen). Adult females and adult males are about the size of a sesame seed, with adult females slightly larger than males. Typically, in late fall, adults mate. Once mating is complete, the male tick will die, and the engorged female (meaning she has taken a full blood meal) will ‘overwinter’. There is some die-off during winter because of colder temperatures, however, snow packs act as an insulator and provide ticks the protection they need to survive the winter. These females emerge in the spring and lay their eggs, and then they die. If any ticks missed their opportunity to mate in the fall, they too will overwinter and emerge in the spring to mate and lay their eggs. These eggs hatch during late summer and the cycle begins again. 5. What puts me at risk for a tick bite? Any outdoor activity leaves individuals at an increased risk for tick bites. Lyme and other tick-borne diseases are not “outdoorsmen” and “backwoods” diseases. Many individuals are infected right in their own backyard. Many suburban areas are at an increased risk due to forest fragmentation and what is called the “dilution effect”. When we have areas of sprawling forests, left virtually uninterrupted (by houses, roads, buildings etc. 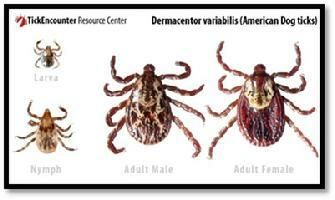 ), we still have ticks, but they are more spread out and less of them are infected. This is because there is high species diversity in these areas, meaning there are many species of animals, giving ticks the opportunity to feed off of many different mammals for a blood meal (how ticks pick up the infection). Mammals vary in the “competence” levels (how well they are able to transmit the Lyme pathogen to the ticks). With high species diversity, there are a mix of competent and “incompetent” mammals (ones that are not very effective at transmitting the pathogen), thus less ticks become infected in these areas. When we create fragmented forests (i.e. suburbs) that are areas of forested land broken up into little ecosystems (by roads, buildings, houses etc. ), we drive out larger mammals. These larger mammals are typically incompetent at spreading the pathogen to ticks and they also serve as predators that keep the smaller, more competent, mammal populations in check. With an increase in competent hosts and a decrease in incompetent hosts (lessening species diversity), ticks in that area can only feed on these smaller more competent hosts, thus increasing the infection prevalence in ticks. Because smaller mammals have a small home range, they do not travel very far, which also increases tick populations. Click here for a more detailed explanation of the dilution effect. 6. How do I prevent tick bites? Cover up when you’re outside! Wear long pants and long sleeves when you are outside hiking, walking, gardening, etc. Tucking pant legs into socks can also reduce your risk of getting a tick bite. TICK CHECKS ARE THE MOST EFFECTIVE WAY TO AVOID DISEASE TRANSMISSION! Check yourself WHILE you are outside- outdoors with a friend? 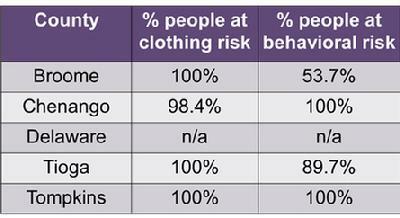 Check each other’s clothing regularly! Also check yourself thoroughly after outdoor activity. A great way to grab unwanted ticks can be a lint roller! Keep a lint roller in your house/car and roll it over your clothes after outdoor activity. If the tick has not attached and is just crawling on your clothing, more than likely, it will stick to the sheet and you can throw it away (put the sheet into a Ziploc bag so you are assured it cannot get out). Check your pets! Pets that spend time outdoors may bring in ticks, which can hop off of your animal and on to you. 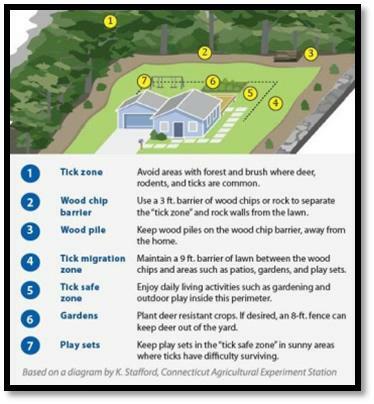 Landscape modification may also help reduce tick populations in your yard, lessening your risk of tick bites in your own backyard. 7. What happens if I’m bitten by a tick? Remove the tick (see “How do I properly remove a tick”) and save it. You can put it in a small Ziploc bag with a little bit of rubbing alcohol. Call your physician. When you go to their office, bring the tick, they may want to send it out for testing. Follow the advice your physician gives you. They may give you a preventive dose of antibiotics. Still watch yourself for symptoms in the coming weeks. If your physician does not choose to give you preventive dose of antibiotics (if the tick was attached only a short time, they may opt not to), as they will tell you, monitor yourself for symptoms and call them if you start to feel any symptoms consistent with Lyme (see “What are the symptoms of acute Lyme disease”). Keep in mind, a blood test for Lyme cannot be run right after you’ve been bitten by a tick. The current tests look for antibodies, and your body needs time to start mounting a response before these can be detected in the blood test. It is normal to wait a few weeks after being bitten to test for the infection. 8. How do I properly remove a tick? Use tweezers (fine-tipped) or a ‘tick key’, etc. Grab the tick as close to your skin as you can. Pull upward with steady pressure. If the tick has been attached for a little while, it may feel difficult to pull out. Ticks secrete a glue like enzyme to ‘cement’ themselves to their host. Do not twist or jerk the tick as it may cause the mouthparts (what is in your skin) to detach and remain in your skin. If this happens, try to remove the pieces left in your skin. If you cannot get these pieces easily, leave it alone. After removing the tick, clean the area with soap and water or rubbing alcohol. Keep your tick if you wish to get it tested (in a Ziploc bag with rubbing alcohol). If you do not wish to keep your tick, do not try to crush it. Ticks have a very strong exoskeleton and it may not be crushed even if you think you’ve used significant pressure. Ticks can be disposed of in a Ziploc bag (tightly sealed) or flushed down the toilet. You want to remove the tick as quickly as possible- do not wait for it to detach on its own! Click here for a video from the New York State Department of Health to show proper tick removal. 9. Can I get my tick tested to see if it’s carrying the Lyme pathogen? Yes! If your physician chooses not to test your tick for Lyme or other tick-borne pathogens, you can send your ticks out to be tested. Please keep in mind that if your tick tests positive for Lyme, or another tick-borne pathogen, this does NOT necessarily mean that the disease was transmitted to you. 10. 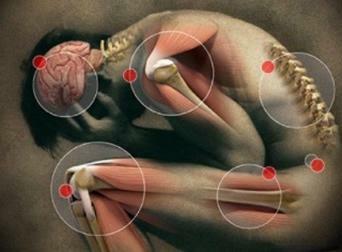 What are the symptoms of acute Lyme disease? Typical symptoms of Lyme disease include flu like symptoms, fever, headache and unusual fatigue. 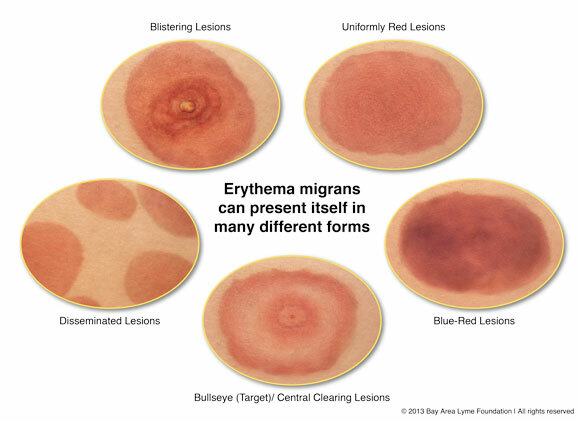 Some patients will develop the erythema migrans, which may present in the form of a bullseye rash. However, the erythema migrans rash often presents itself in many different forms, if it presents at all. Many people never develop a rash of any kind. Lyme is often called the “Great Imitator” because its symptoms are common in many other illnesses. If Lyme goes untreated, infection can spread to joints causing severe arthritis, to the heart causing Lyme carditis and to the nervous system resulting in cognitive involvement. 11. Can Lyme become a chronic infection? 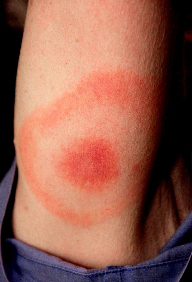 The CDC recognizes that 10-20% of patients treated for acute Lyme disease will go on to have persistent symptoms lasting more than 6 months. This is a condition known as Post-treatment Lyme Disease Syndrome (PTLDS). Patients suffering from PTLDS or Chronic Lyme disease experience very unusual, prolonged fatigue, headaches, muscle aches, joint pain and twitching, memory loss and cognitive impairment, sleep disruptions, heart related issues, gastrointestinal issues and psychiatric involvement. A survey showed that more than 40% of patients with persisting symptoms reported that they were no longer able to work because of Lyme and nearly ¼ of them were on disability at one point during their illness. Lymedisease.org has developed a Symptom Checklist that may be helpful in assessing whether you may or may not have been infected with Lyme. This is NOT a diagnostic tool, and is meant only to help you keep track of your symptoms, and have a document to bring to your physician to discuss if treatment is necessary. It has been proposed that the pathogen can go into ‘hiding’ in the body, causing the initial treatment of antibiotics to be ineffective. Long-term antibiotics have not been shown to be effective for patients with PTLDS. However, recent studies from Northwestern University have shown that B. burgdorferi (the Lyme pathogen) can form dormant persister cells. This means that they are able to evade antibiotic treatment and ‘hide’ in the body, which could be why Lyme is so difficult to treat in some individuals. This research suggests that pulse-dosing antibiotics can eliminate these persisters. These persisters are ‘hiding’ during the initial treatment of antibiotics, so they are not eradicated, but when antibiotic treatment stopped, the persisters ‘woke up’, and were hit with another round of antibiotics (before they had time to reestablish their populations) which eradicated all persisters. These studies were conducted in test tubes, but can hold very promising for future treatment of chronic Lyme/PTLDS patients. If you would like more information on the effects of Chronic Lyme disease, Under Our Skin is a very informative documentary film discussing the controversy of Chronic Lyme disease. Under Our Skin 2: Emergence is the sequel to Under Our Skin and follows the patients we met in the first film, discusses the disease’s persistence, new research and medical collusion and conflicts of interests that can impede progress to better and more effective treatment. 12. How big is the problem? In 2013, the CDC released a statement, saying that although roughly 30,000 cases of Lyme disease are diagnosed annual, they feel that in reality the actual number of cases is ten times that, with approximately 300,000 cases of Lyme disease annually in the United States. 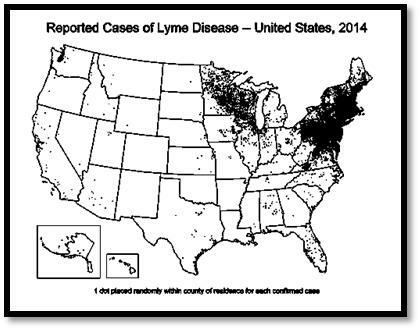 Maps showing the growing number of Lyme cases by year can be found here. 13. What research is currently being done in our area? Graduate and undergraduate students at Binghamton University have been studying Lyme in the local area since 2011. Research efforts encompass Broome, Chenango, Delaware, Tioga and Tompkins Counties currently. Starting in June 2016, Otsego County will be added to encompass the entire Upper Susquehanna River Basin. This research involves determining the density and infectivity of the primary reservoir host for the Lyme pathogen (the white-footed mouse), determining the density and infectivity of ticks, assessing what behaviors and clothing choices put people at risk for being bitten by a tick, what vegetative variables may influence tick and mouse populations, with an ultimate goal of developing a risk algorithm for use in public health settings. Preliminary data suggests that over 50% of mice are harboring the Lyme pathogen. All rodents are dissected and organs are individually tested to determine where the pathogen sequesters (or ‘hides’) in the body. The bladder has the highest infectivity thus far, followed by the heart and spleen. Preliminary data for tick density (data collected Summer 2015) is shown below. These are considered high tick densities. To put 1000 square meters into perspective, imagine 1/5 of a football field (excluding one endzone). 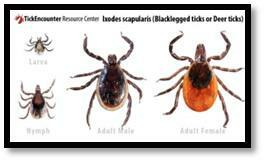 Preliminary laboratory results show a high number of infected ticks in most counties. During the summer of 2015, only 7 ticks were found in Delaware County. 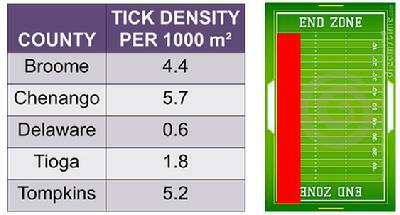 There are many ecological factors that influence tick activity. If it is too wet or too dry, ticks will not be active. This may have been the case for the days the research team was collecting ticks. All counties will be returned to during summer 2016 to get a more accurate assessment of tick density and infectivity. 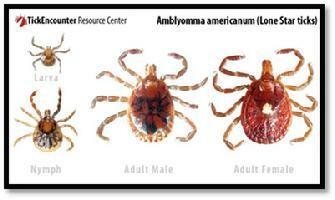 Remember, these infectivity rates represent those of mostly nymphal ticks, which are the most dangerous stage to humans. Within the Upper Susquehanna River Basin, during the summer of 2015, 30-40% of ticks were carrying the Lyme pathogen. Always remember to do tick checks and follow proper tick safety! The data from this research suggest that public parks within the Upper Susquehanna River Basin have a high tick density and infectivity rate which is cause for concern. With high infectivity and high human risk, our data suggest that human infection rates may be significantly underreported in the Upper Susquehanna River Basin. Our data suggest the need for greater public health outreach and recognition by the medical community, as well as the development of risk management models. System dynamics models are currently being developed to better understand and predict risk of infection within the region and throughout the Northeastern United States. Fieldwork will continue during the summer of 2016 and results will be shared with county health departments so prevention/mitigation strategies can be developed and implemented. Students in SUNY Broome’s AA1 Program in “The Art of Science” class, under the direction of Dr. Tracy Curtis designed a documentary for people to learn about Lyme disease in Broome County. They discuss what individuals know about Lyme disease, get input from several patients and doctors that discuss their experience with Lyme, and highlight local research efforts. 14. Would you like to take part in current research in your local area? Seeking participants who have had, or currently have Lyme disease AND those who have never had Lyme disease to assess lifestyle changes and health outcomes. This study will assist in increasing awareness, directing future research, and implementing public health prevention strategies for Lyme disease. Take the anonymous online survey! 15. Where can I get additional information regarding ticks and tick-borne diseases? Click here for a pdf version of this webpage!